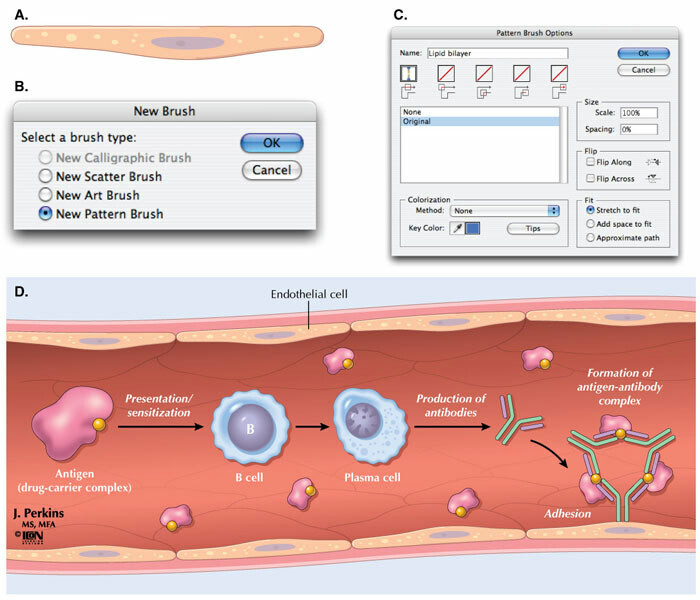 Start by creating an object or group of objects, such as the simple endothelial cell below (A). Note that pattern brushes cannot contain gradients, gradient mesh, effects and some other types of objects. Select the object(s) and drag them onto the Brushes palette. From the dialog box that appears (B) select "New Pattern Brush" and click OK. In the next dialog box (C) give the brush a name. There are options to scale the objects or add space between the repeated objects when they are applied to a path. You can also flip the objects from left to right (Flip Along) or top to bottom (Flip Across). Click OK and the new brush will appear in the Brushes palette. You can then select any path and apply the brush to it (D). 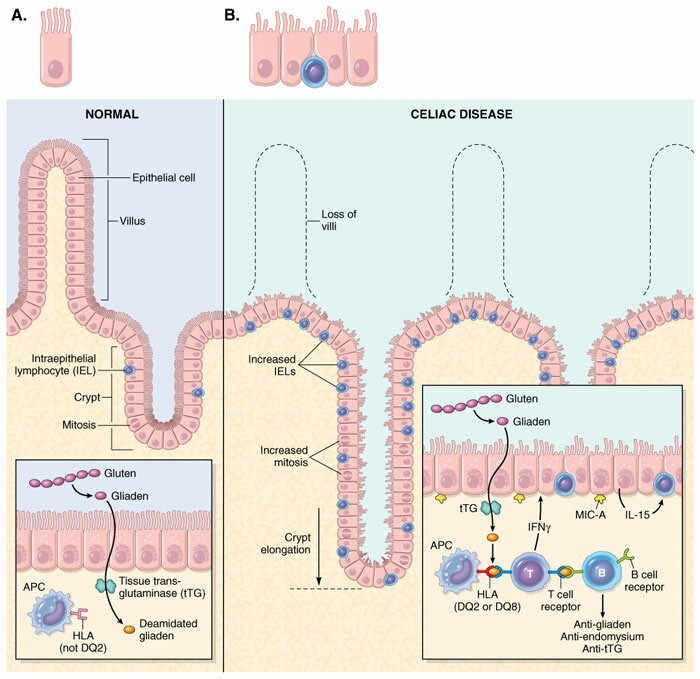 The illustration below compares normal intestinal mucosa with damaged mucosa in celiac disease (sprue). On the left (A) I created a simple columnar epithelial cell with a brush border and basal nucleus. Notice how the cell is repeated along the path and stretches to conform to the tight bend in the intestinal crypt. Two features of celiac disease include a ragged brush border and increased numbers of intraepithelial lymphocytes (IEL). I created a more complex brush (B) to achieve both results. By grouping several epithelial cells into a single brush, the ragged brush border appears more random than if I repeated just a single cell along the path. I included the IEL in the brush so I didn't have to draw all of them individually (although I did go back and add a few more later, to make their distribution a little less uniform). Here's another example of a complex pattern brush to create what appears to be a very random, irregular pattern of cells. On the left (A) I created a simple cuboidal cell for the epithelial lining of the uterus. I created an irregular cluster of cells (B) for the endometrial and serous carcinomas. Notice that the left and right edges of the cell cluster (B) are irregular. When applied to a path, these irregularities create gaps in the brush (C). There are two ways to solve this. First of all, you could cut the path into segments and drag the endpoints of adjacent segments so the paths overlap, eliminating the gaps. The other way is to expand the brush into individual objects (Object > Expand Appearance) and reshape the adjacent cells to fill the gaps. 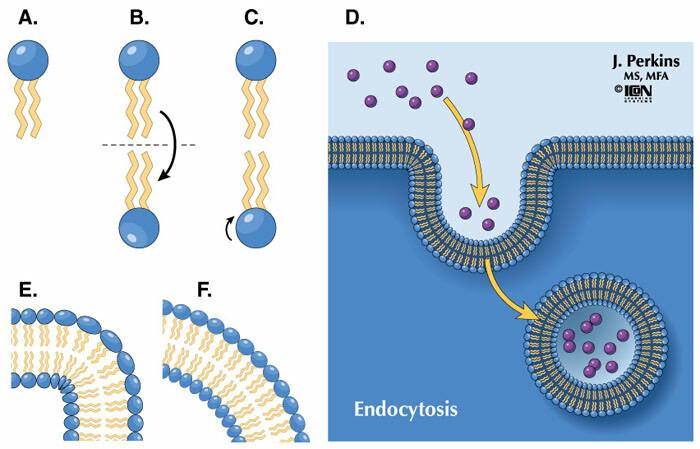 I've used a pattern brush dozens of times to create stylized lipid bilayers. Imagine how many hours I saved not having to draw each one of those little balls. Although not entirely accurate, phospholipids are universally represented as a little ball (the phosphate head) with a couple of squiggly lipid tails. In the example below, I started with a simple blue circle (A). To create the illusion of upper left lighting, I added light blue (midtone) and white (highlight) ovals to the upper left side of the circle (remember, you can't use gradients in pattern brushes). I then added a couple of yellow squiggles for the lipid tails (don't let the tails extend beyond the left or right edge of the "head" as this will create gaps between the heads when applied to a path). To create the mirror image phospholipid, I used the Reflect tool to reflect and copy the objects across a horizontal axis (B). This changes the position of the highlight on the lower phospholipid, so it must be reflected or rotated back to the upper left (C). Drag all of the objects to the Brushes palette to create the brush and apply it to a path, as in the Endocytosis example below (D). If you could zoom in on this illustration, you would see that the phosphate heads become extremely distorted where the path makes a sharp turn (see the enlarged view in E). Because this figure was reproduced at a small size, I didn't worry about it. The only solution is to avoid sharp turns and kinks and only apply the brush to gentle curves (F). The image below shows a DNA double helix pattern brush. On the left is the artwork to create the brush and, on the right, the brush is applied to a curving path. The trick here is for the left hand edge of the two DNA strands to line up perfectly with their right hand edges (A). Otherwise, the objects won't repeat properly and the DNA "ribbon" will have kinks or gaps. Since you can't use gradients in a pattern brush, the only way to create highlights and shadows is to add separate light and dark-colored objects (B) before making the brush. Here's an example of my DNA pattern brush, showing how the DNA strand winds around histone proteins to create nucleosomes, the building blocks of chromatin. 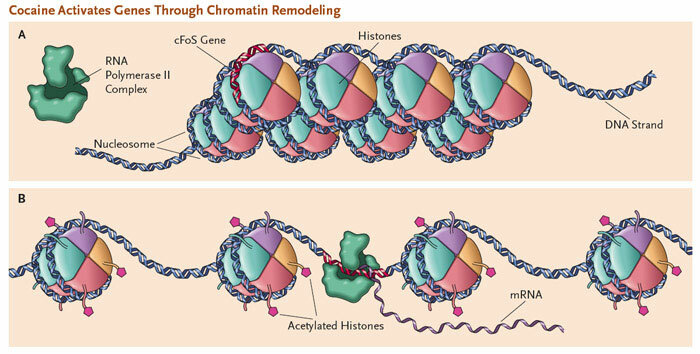 This illustration shows how cocaine addiction may be modulated by acetylation of histones, unwinding of the chromatin, and expression of otherwise suppressed genes (e.g., cFOS). Jim Perkins is Associate Professor of Medical Illustration at Rochester Institute of Technology, a Board Certified Medical Illustrator (CMI) and a Fellow of the AMI. He has been using Illustrator for nearly 20 years (since Illustrator "88"), mostly for textbook illustration and clients in the pharmaceutical and medical device markets. He has illustrated over 20 textbooks and has contributed artwork to several recent Netter titles. He has won several AMI salon awards, including the 2005 Illustrated Medical Book Award for Netter's Illustrated Pharmacology.